Azoria (Azorias, Kavousi, northeast Crete) is a rounded hill, one kilometer southeast of the modern village of Kavousi in eastern Crete. 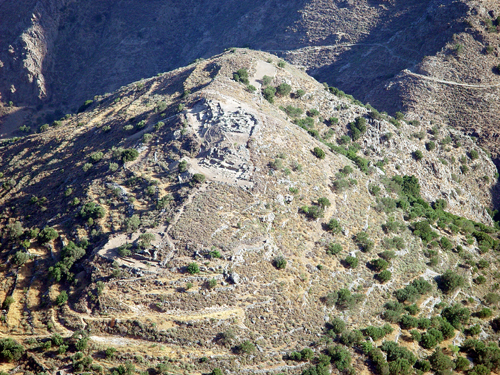 The site occupies a naturally strategic position, some 300-372 meters above sea level, at the confluence of two rivers—and traditional transportation routes— at a juncture between the lowland plain of the north Isthmus of Ierapetra (Kambos Kavousi) and mountain valleys of Avgo and Papoura that form the northwestern edge of the Siteia mountains. Excavation was conducted for 6.5 weeks, from June 3 until July 16, followed by 3.5 weeks of study, cataloguing, and processing of finds at the Institute for Aegean Prehistory Study Center for East Crete (INSTAP-SCEC). The primary target area is two hectares on the hilltop of the site, which was purchased for the Greek government to be reserved as an archaeological site. The staff consisted of fifty-three people: the Project Director (Donald Haggis); Field Director (Margaret Mook); Science Director and Zooarchaeologist (Lynn Snyder); Palaeoethnobotanists (Susan Allen and Margaret Scarry); Physical Anthropologist (Maria Liston); Architect (Rodney Fitzsimons); Topographer/surveyor (Georgos Damaskinakis); Excavation Foreman (Manolis Kassotakis); Conservator (Kathy Hall); Artist (Roxana Docsan); and Registrar (Holly Parton). There were eight trench supervisors (K. Bishop; M. Eaby; M. Liston; W. McCall; J. Manese; S. Pak; G. Park; P. Vanaria); ten student volunteers (A. Callis; N. Doub; G.B. Ernst; E. Marion; K. Miller; S. Krebs; D. Park; T. Rohrbeck; S. Swingler; P. Tessler; three consultants (John Scarry; David Small; Antonia Stamos); fifteen workmen (A. Dantes; A. Syritoules; S. Koutsakis; M. Kophinakis; I. Papadakis; G. Kanitakis; P. Hantzidakis; K. Lionoudakis; B. Phiorakis; K. Boutas; M. Dantes; G. Souriadakis; E. Maniadakis; E. Sobanakis; N. Spiliarotis); and six potwashers (K. Daskalogianaki; S. Tzari; M. Kanitaki; A. Kassotaki; K. Siganou; M. Phioraki). Funding for the project was provide by the National Geographic Society (7193-02); the National Endowment for the Humanities (RZ-20812); the Wenner-Gren Foundation for Anthropological Research (GR 6875); the College of Arts and Sciences, the Office of the Vice Chancellor for Research, and the Department of Classics of the University of North Carolina at Chapel Hill; the Institute for Aegean Prehistory; the INSTAP Study Center for East Crete (in kind); and the Azoria Project Fund (0-65305-42). (1) to explore the form and various features of an Archaic city (sixth and early fifth centuries BC). 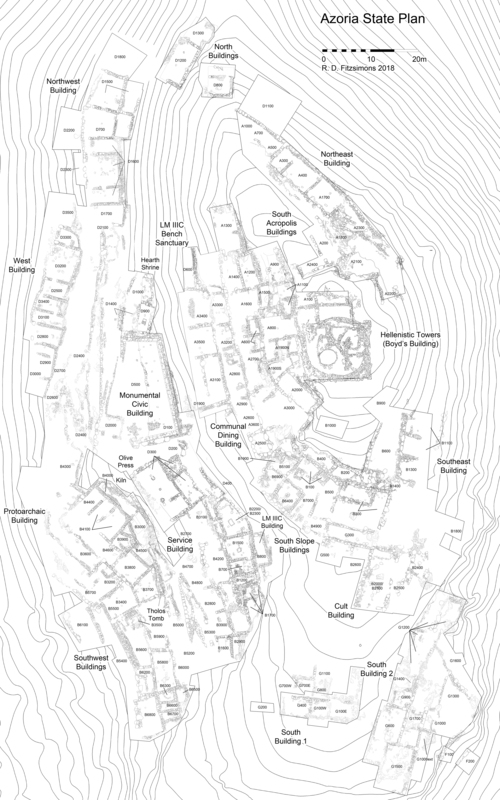 The plan, spatial organization, and formal features of early Greek cities are generally not well known in the Aegean, while on Crete there is an apparent gap in the archaeological record. 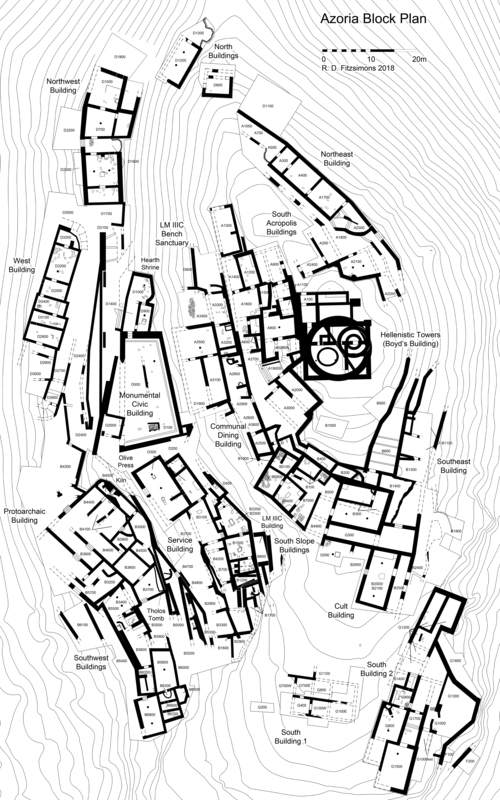 An aim of excavation is to fill this sixth-fifth c. gap and to improve our understanding of the economy of an Archaic Greek town, its domestic and urban architecture and sociopolitical contexts. (2) to examine the emergence of the city—the process of urbanization— by means of the recovery and analysis of material from Early Iron Age levels (1200-600) preceding the foundation of the Archaic-period buildings, and the earliest phases of urban development in the 6th c. How did the settlement change in form through time; how did functions of individual buildings and areas of the site change; and are there discernable differences in the types of animals and crops raised and consumed in various periods of occupation? (3) to recover floral and faunal remains from diverse contexts which might allow us to reconstruct details of economy, land-use, and production and consumption patterns in the early city and differentially across the site. Are there changes in production strategies, diet, and storage patterns at the beginning of the sixth c. that might be correlates for the emergence of a state-level economy? One focus of botanical work is the degree of centralization of crop processing and storage. (4) to recover evidence for regional and foreign, especially Aegean, Cypriot, Near Eastern and Egyptian, imports that might suggest the level and intensity of inter-Mediterranean exchange and organized trade. The common historical and archaeological pictures of sixth c. BC Crete—based on largely negative evidence—suggest a period of economic decline and political disintegration after the exuberant “orientalizing” periods in the 9th-7th centuries. An aim of excavation at Azoria is to address directly the question of off-island contacts and the role of Crete in the 6th-5th c. BC Mediterranean sphere. (5) to recover evidence for Prepalatial and early Protopalatial Bronze Age occupation at the site that could help us understand the form and function of Minoan settlement in the Kavousi mountains, substantiating the model of hamlet clusters derived from intensive survey in the area. A total area of 0.13 ha. (ca. 1312 m. sq.) was excavated during the 2002 season. 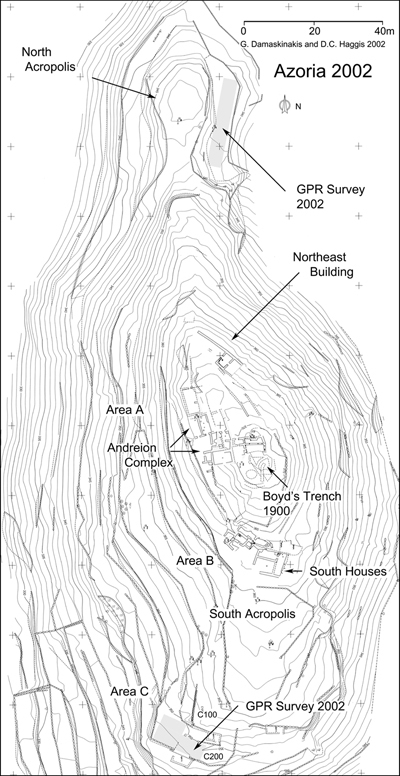 Three broad sampling areas were selected on the south acropolis and south slope, labeled A, B, and C on the plan. Area A consists of the northern part of the south acropolis, including part of the hilltop where Harriet Boyd had originally excavated (A 100; Boyd 100, 200); the west slope (A600; A800-900; A1100-1600); and the northeast slope (A200-500; A700; A1000). Area B is the south-facing south slope of the hilltop (B100-500); Area C is the southwestern edge of the south acropolis, containing two trenches (C100-200). Routinely soil samples were retained for flotation (at the INSTAP-SCEC): 5 liter standard samples were collected from every locus excavated, while targeted or intensive sampling was conducted (on average 20 liters/locus; as much as 100 liters per locus) in definable features and stratigraphically significant loci. In 2002, a total of 469 soil samples were taken for flotation, out of which approximately 160 or about one third were standard samples, while two-thirds or some 309 were intensive samples. The carbonized material from the residue (coarse material) will be sorted and analyzed at the INSTAP-SCEC, while the entire light fraction (flot) will be scanned, sorted, and studied at the Research Laboratories of Archaeology at the University of North Carolina at Chapel Hill, the permit for which is pending. Surprisingly a considerable amount of light botanicals—especially fragments of grapes and olives—is recoverable in the coarse fraction of the water sieve. On site, 0.25-inch mesh dry-screening, supervised by zooarchaeologist and Science Director Lynn Snyder, was conducted in all stratigraphically significant deposits (floors, habitation debris, floor packing, hearths, bins, fill deposits, etc.). A minimum of 2649 zembelia of soil was screened (ca. 53,000 liters or some 64 tons). The aim of this intensive dry-screening was to maximize the recovery of bones of small animals, fish, and shell fragments. Occasionally larger-size botanical material, such as olive stones, were recovered in the .25-inch mesh.